CorneliOS is an easy-to-use and cross-browser "Web Desktop Environment", "Web Operating System" or "Web Office" and comes with a set of cool applications. A Pure Java Office suite which is compatible with the MS file formats. A Pure Java Office suite which is compatible with the MS file formats. Since it doesn't require native libraries, it can be loaded inside any browsers and any platforms. Notably it promotes Enterprise 2.0 by combination of uEngine BPM and Web Office. You can save or edit your dictations online. When you have finished recording just click send and the recording will be sent to your typist immediately by email. This is perfect when you are away from your office and want to get dictation to your typist fast. 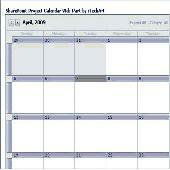 SharePoint Project Calendar Web Part provides a SharePoint event/task view in calendar view. You can create and attach your task calendar to team site. Zolsoft Office Server is office automation software consisting of various servers, namely, network disk, Web, Client, FTP, SMTP and POP3. It can divide users into different workgroups and create folders of workgroup. CyberMatrix Office is a virtual office collaboration program. It is designed for those companies that would like their employees to work from home yet still be accessible to those that need to work with them.